Hi, I am Sam Saunders, aka The Baby Guru. Mother of 4. Infant sleep trainer. In the last 10 year’s, I have helped between 450 to 500 babies, with sleep coaching, weaning and working with parents on routine. The app is easy to use and intuitive, it is for parents who would like help in getting their little one to sleep in their crib or cot. I teach you my tried and tested methods with an easy to use simple app, with emojis and animations. Also, voice commands, so that you can listen to me when you are busy. 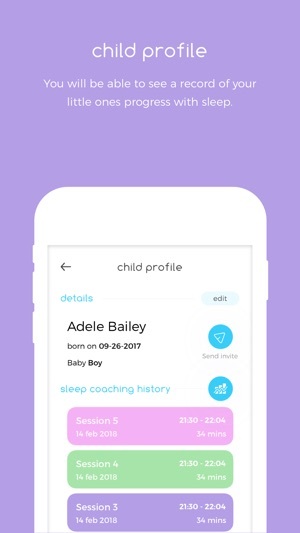 It is a responsive sleep coaching app, an interactive, detailed step by step guide, which gives you real time help, responsive to your babies’ reaction to sleep coaching. Helping little ones learn how to settle themselves independently to sleep without the need to feed be rocked or a dummy replaced every time it falls out. So that when they wake in the night or early from a nap they are able to go back to sleep themselves. 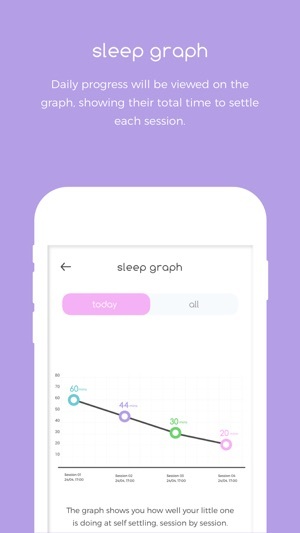 A personalised graph showing your baby’s sleep progress by day. ONCE DOWNLOADED THE APP CAN BE USED AT ANY TIME, SO IF THINGS SLIP AND OLD HABITS OR NEW HABITS START, THEN LOG BACK IN AND HAVE THE SUPPORT AND TOOLS TO GET THINGS BACK ON TRACK. GETTING THAT ALL IMPORTANT GOOD NIGHT’S SLEEP AGAIN FOR ALL. NB: Only use the programme if your little one is fit and healthy. Sam Saunders - The Baby Guru, has been in midwifery and helping parents for over several years in the NHS and Private Sector. • Sam the mother of 4, saw a need for a bespoke service to help parents with their babies, in their formative months, from thebabyguru.co.uk, was born. • Sam’s work is truly amazing , she can make a massive contribution to a happy family life . If you are brand new to trying to get your baby napping/sleeping though this is going in at the deep end a little. This is great for those that already “get” and have routine and structure. 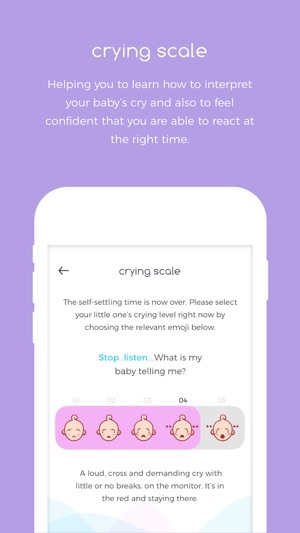 I had just lost my way with baby no 2 and this has been a great tool to stop me taking the perceived easy way out and just go in to rock my crying baby. Sam’s online assistance is the best bit. Apart from that it’s essentially a stop watch. If you could edit sessions to amend start and finish times it would provide a much more accurate graph of the progress being made (as in those times you think baby has dropped off, you click Baby is Asleep, then the little so-and-so starts up crying again. As it is now you have to start it as a new session even though it’s clearly the same one). Not awful by any means, but I think if you’re truly in trouble with a sleepless baby and have no idea what to do this is a little further along the Sleep Training Journey than you need. Hi , thank you for downloading our new app and for your review . I will certainly look into having the option to edit each session , as you say you think they have gone to sleep only to hear them 10 minutes later . I hope you managed to check out all the top tips and FAQ questions the app tries to answer. I hope your little one is sleeping and if you need a more 1 2 1 service please contact me through the contact us email button . I’ve not seen or found an app that does anything like this. The immediate support it gives me and my partner is fantastic. Going on the website and getting further support from Sam has been genuinely invaluable. We’ve learnt so much and are so thankful we found this. Couldn’t recommend getting it enough!!! Hi , thank you for such a great review . 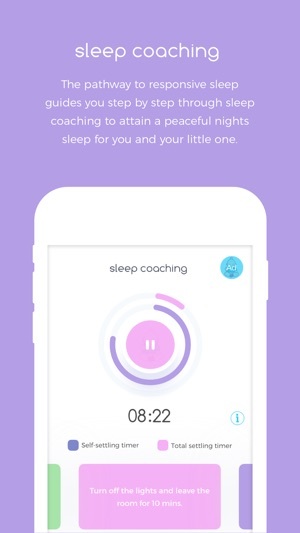 We really did our homework and agree there was little help out there for parents with sleep training on the App Store . My passion is sleep and helping families is my biggest wish . Hi , thank you for downloading the app and your positive review . Was great to see you used it for two little ones , and that things have improved.